1: Collect lots of pics: Have a love and hate pile. It really helps visualise what you’re after! 2: Look after your skin: Once a week exfoliation and a good moisturiser and eye cream will make a big difference. 3: Drink lots of water to keep skin as healthy and plumped up as possible. 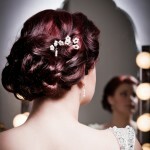 4: Don’t have a haircut just before your wedding in case they cut off too much. Remember, dry ends can always be cheated for one day. You can get it lopped off after the wedding. 5: In if doubt, cheat: American dream extensions are great for quick hair length and volume. 6: Don’t do anything too different from your norm: If you never wear a strong lip colour don’t decide to go red on your wedding day – you’ll regret it. 7: Get your manicure done the day before your wedding you’ll be glad of 45 mins to yourself! 8: Always tell your artist about your dress: It makes such a difference to the overall styling. 9: Take some spare kirbi grips and blotting papers in your bag for you and your maids hair just in case! 10: Be honest with your artist: We‘ve all done it at the hairdressers. We say thanks and then run home and wash it out! It’s the most important day of your life so make sure you look and feel 100% perfect and say if you don’t! Thanks to Beauty Call for this guest post. Images credited to David Price Photography.